If you know me well, you know that for the last month I have been anticipating a lovely surgery of my toe. Well, alas, it is finally over and my poor little toe is healing as fast as it can so it can be productive and healthy for a 10K race I am signed up for on October 15th. A race I have been training for week after week for 3 months, that I hope I get to still run in. My stitches will be taken out next Thursday, which will still leave over a week until the race. Unfortunately, if the doctor says no to running, I will obey his orders… but, I have a good feeling I will be healed by then, even if I do not get a chance to run again until the race. 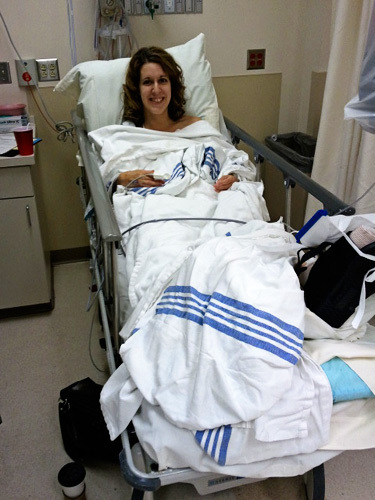 Here I am after the surgery! Here is my foot in a walking shoe. AND there is a huge icepack on my foot. Really!!! 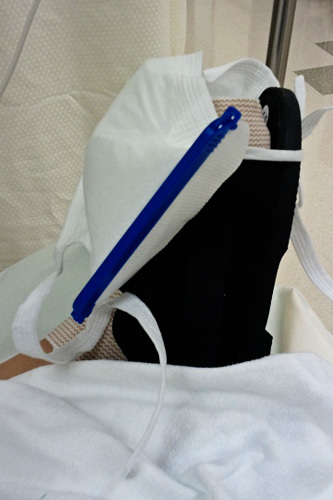 All this for just a little toe surgery! Oh, and the surgeon said that it was just scar tissue that was causing the little bump/cyst/whatever on my toe. I am not sure how I got scar tissue there, which may be a good question to ask him when I see him next week. It was sort of right where the middle part of my flip flops are, so I am not sure if that could have caused it? Running? Or maybe my toe just wanted to give me trouble? Who knows! 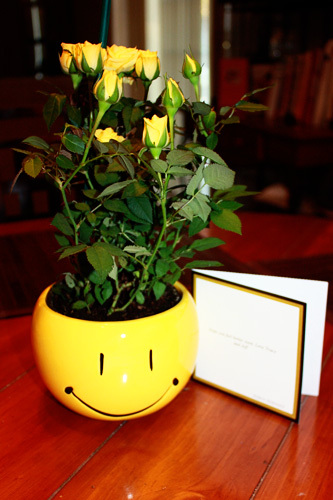 I was really surprised when Fedex arrivd with a beautiful yellow rose bush for me in a smiley face pot. So cute! Thanks Jeff and Tracy! So sweet of you both to think of me!